News & Trends> Product Trends > Industrial machines and equipment > Dry Cleaning System does not require compressed air. Dry Cleaning System does not require compressed air. Monschau/Germany – Machined powertrain components undergo intermediate cleaning to safeguard the quality of subsequent process steps. This is typically done by means of compressed air, which must be generated at a high expense of energy. With their new EcoCVac, Dürr Ecoclean offers an effective dry cleaning system that eliminates the need for compressed air. Apart from delivering enhanced process reliability, the system can provide energy savings of more than 50 percent. As maintenance of the working chamber is minimized, it also improves the machine availability. Modern engine and transmission manufacturing lines are designed for maximum productivity and economic efficiency. Accordingly, any cause of interference with a downstream process must be eliminated. This makes it mandatory that engine and transmission parts such as, e.g., cylinder heads, engine blocks and transmission housings undergo cleaning operations between machining steps. Such intermediate cleaning is often performed by cleaning machines using compressed air. A benefit of this method is that the part is cleaned 'dry'. On the downside, however, generating the compressed air supply is very costly. Moreover, the chips and machining fluid residue adhering to the product are merely blown off – i.e., allowed to spread around in the work chamber, which will therefore become contaminated quickly. This, in turn, increases the risk of re-contamination of the product, with the possible result of impairing the next processing step. With its innovative EcoCVac pre-cleaning and intermediate cleaning system, Dürr Ecoclean of Monschau/Germany has overcome these drawbacks. The equipment relies on the newly developed vacuum suction technology. This ensures that contaminants will be removed not just from the part but also from the work chamber within a mere 1.5 to 3 seconds of process time. The EcoCVac system comprises a pressure vessel in which a vacuum is maintained permanently. This vessel is connected by a pipe to the vacuum chamber in which the part is placed. Once the chamber is closed, a powerful airflow is directed through it, thereby 'entraining' the chips sticking to the part and taking them into the vacuum vessel. A chip clean-out device integrated nearby separates chips and emulsion, allowing both to be discharged separately via a collecting bin and a flume, respectively. In the development of the EcoCVac system, resource efficiency was a prime concern. As a result, the system affords a much-reduced energy consumption as compared to compressed-air type equipment. 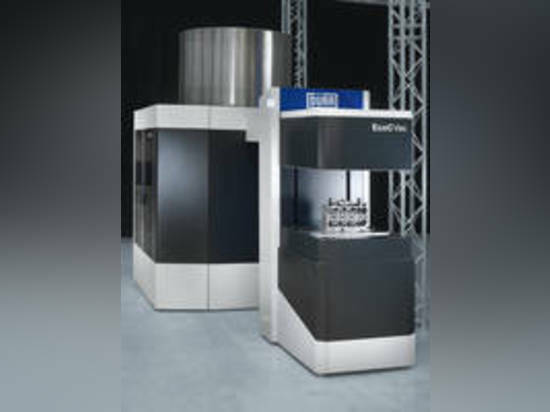 Assuming a compressed air consumption of 2.5 Nm³ per part at a price of 1.26 euro cents per Nm³, the cost of one compressed-air blowing cycle amounts to 3.15 euro cents per part. With the new vacuum dry cleaning process, an electric power input of 0.139 kWh per part is needed. At an estimated electricity price of 10.88 euro cents per kWh, power costs of 1.51 euro cents per part will thus be incurred. This is equal to a cost reduction by more than 50 percent. In addition to the obvious cost benefits, the EcoCVac shines with its improved process reliability. As the chips are removed not only from the part but also from the work chamber, the risk of re-contamination is minimized. The chamber must hence be cleaned less often, and at a clearly reduced cost and effort. Moreover, unlike conventional compressed-air systems, there are no nozzles to be aligned relative to the part, e.g., during commissioning or after a collision. The system's availability rate is thus further improved. 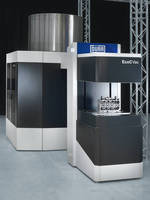 EcoCVac pre-cleaning and intermediate cleaning system, designed for machined powertrain components, employs vacuum suction technology to ensure contaminants are removed from part as well as work chamber within 1.5–3 sec of process time. Integrated chip clean-out device separates chips and emulsion, allowing respective discharge via collecting bin and flume. Design for resource efficiency, system requires electric power input of 0.139 kWh per part and minimizes risk of re-contamination.